"I never keeled a dug before," a killer horse named Tuerto threatens Hank. What has brought Hank to this desperate situation? Why is he wearing a dress? Is that really Hank at a little girl’s party? 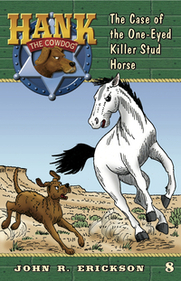 In The Case of the One-Eyed Killer Stud Horse, things are looking pretty bleak for Hank the Cowdog. First he gets sick on poisoned bacon grease. Then he accidentally trips Sally May—and she ends up with a broken ankle...just as relatives are about to arrive at the ranch for Thanksgiving. And if that’s not bad enough, he gets stuck playing dress-up with Amy and Ashley, Little Alfred’s cousins. But when Tuerto the Killer Stud Horse breaks free and charges at the girls, Hank knows it’s up to him to protect them. He’ll show that one-eyed horse who’s boss—even if it means risking his own life!